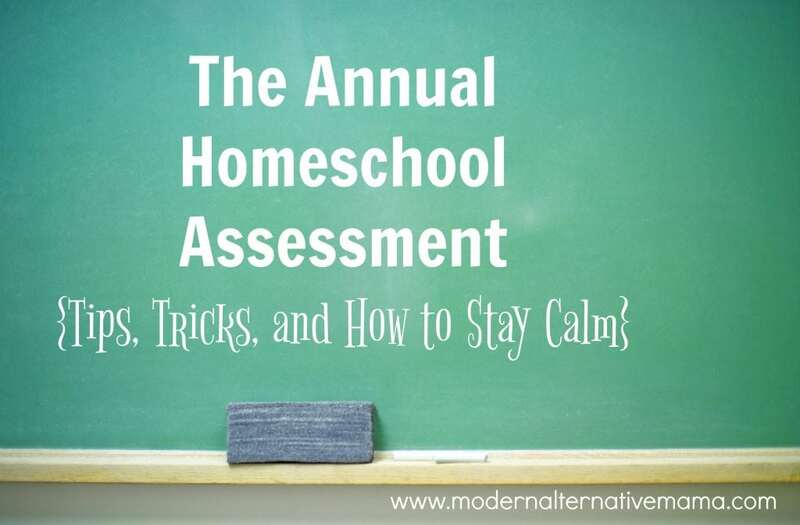 This year will be our fourth time doing our annual homeschool assessment. It was (obviously) our fourth year legally homeschooling, and our fifth year all together (our state doesn’t require reporting for K). We’re pretty much old hat at this now, but I remember being very nervous about doing our paperwork and our first assessment a few years back. Luckily, it is not such a big deal, but it is intimidating if you have never done it before. That’s why I want to share what we’ve learned along the way, and hopefully make you feel better prepared and more relaxed about the whole process. I should note, I am in Ohio. I am no expert on our state laws, but I have read them and follow them to the best of my knowledge. So, I cannot say that my experience in Ohio will translate to other states, and it’s best to check your state’s laws and join a homeschool support group for your state to be sure you are following the laws. In the state of Ohio, the laws are fairly simple. At the beginning of every school year (no official deadline), we are required to notify our local school district’s superintendent that we will be homeschooling. This notification contains our child’s name, birth date, address, and other basic information. We also check boxes and certify that we will provide 900 hours of instruction on a variety of subjects, including math, science, reading, art, physical education, health and safety, etc. We also provide a general curriculum outline. “900 hours” is not “classroom time.” It does not require us to sit down at desks and mimic a public school environment. Rather, it is 900 hours of “learning time.” Our learning takes places in all different locations and ways, and I’m sure we far exceed this requirement. As for the subjects and curriculum outline, these are “for informational purposes only.” They are not approving our choices. They legally have no say. We are simply informing them of our general plan. I list books my kids are interested in, museum memberships, the library, and other generic resources for each subject. We have never had an issue with this. The state has 14 calendar days from the time the notification is postmarked to raise any questions or concerns or ask for additional information. If they allow this time to expire, then they are expected to provide the excusal letter anyway. The letter should state that they have received the notification, and that the student is excused from compulsory attendance. A lot of people misunderstand the laws, and feel like they have to provide a public school-esque education, with 900 hours of sit-down classroom time, following an ‘approved’ curriculum that covers all required subjects, and that the state is “approving” their request to homeschool. None of this is true. Once you have homeschooled for a full year, subsequent notifications must contain an evaluation form signed by a certified teacher, or results of a national standardized test. And that brings us to the real subject of today’s post: the evaluation. While we could choose a standardized test, I don’t personally think these are appropriate for very young children, and I question their value even in older kids. I’m sure we will choose them once or twice when my kids are older, should they decide to go to college. But for now, we stick to the evaluation. There are teachers whose main or only job is to evaluate kids and/or work with the homeschooling community. Many teach different homeschool classes throughout the year, such as gym, art, creative writing, etc. In my opinion, it is best to find an evaluator who is involved in and supportive of the homeschooling community. While any certified teacher would work, a teacher who is unfamiliar with homeschooling may not be the best person to understand how to do this and may be looking for a “public school at home” model. It may be frustrating for both parties. So, ask around and find someone who is experienced in working with homeschoolers. Below, I summarize some frequently-asked questions about this process! Most evaluations cost $40 – $50 for one child in my area. We are paying $100 for three kids this year, and our cost will max at $120 for 4+ students. Most should offer discounts for multiple kids. One child should take 20 – 30 min. It may be less in the early years when there’s not that much to cover, and it may be more if your child has special needs. Does My Child Have to Go? Every evaluator has his/her own preference. Ours does not require it. We have done one in-person evaluation that the kids attended, and three phone evaluations that they did not. Samples of your child’s work, including photos of projects, worksheets, reading lists, etc. In very young students, you may not have much and that’s okay. As kids get older, there should be more evidence — books, papers, projects, outside course grades. Is the Teacher Testing My Child? Generally, no. This is an assessment, not an exam. You are presenting a portfolio of your child’s work for the teacher to look over. If you want a test, choose a teacher to proctor a standardized test instead. The teacher should ask how your child is doing and look over the work samples. S/he may ask what progress your child has made in core subjects and if you have any concerns about him/her. You’ll have a conversation about your child, not unlike a parent-teacher conference (except you’re more the “teacher” in this setting!). After the conversation, if the teacher believes your child is progressing, s/he will sign a form, stating that your child is progressing “to the best of his/her abilities.” This is the form you will send to the state with your new notification. What if I Unschool/Don’t Use Curriculum? It’s fine! Bring samples of what your children have chosen to do. We bring books the kids have read, projects they did, pictures of field trips we took, math worksheets, and more. The teacher and I have a conversation about their progress and any concerns I have. Tell your evaluator. This is not a reason your child can’t continue homeschooling. (Kids struggle in public school, too!) Your evaluator may be able to point you towards classes, tutors, curriculum, or other resources to better address your child’s needs. Or even reassure you that your struggles are normal and you’re doing fine. Definitely ask for help if you need any. That’s part of this process. Special needs children, depending on what the situation is, may not make “average” progress in a year, and that’s okay. They only need to be working “to the best of their abilities,” whatever that is. If your child is receiving therapy or services, document those and bring that along to show your evaluator. Congratulations! Your school year is over (if you want). Take a break and enjoy. Or, just keep going, like we do! Fill out your new notification form and tuck your evaluation in, and send it off to the superintendent. If you have an in-person evaluation, you will probably walk away with a signed paper. If it’s on the phone, your paperwork should come via email or snail mail in a few days. I usually do this immediately so I don’t forget or lose my paperwork over the summer. Do you have any questions about your homeschool assessment? Ask below!